Want to create better social video content? Looking for tips and tools to try? In this article, 10 video experts share the tactics and tools they use to create successful video content. One of my favorite live-streaming tools is Elgato Stream Deck, a video switcher that’s about the size of a pack of playing cards. Before using the stream deck, I would assign hot keys (Command 1, for instance) on a keyboard to my intro and different scenes that allowed me to show my camera, my guest’s camera, or a split screen of me and my guest. This often forced me to look down and away from the camera. With this piece of hardware, I can live stream and produce my show at the same time. I can instantly play an intro video and easily switch scenes, launch graphics, play sounds, and more without looking away from the camera. The drag-and-drop setup for the stream deck button is done on your computer and instantly carries over to your buttons. You can set up folders for multiple shows and assign different scenes for each show, which means managing your shows is now at the touch of a button. Stephanie Liu, one of the most sought-after international speakers on live video, is most notably known for her Facebook Live show called Lights, Camera, Live®. There are many reasons why I love live video. One of the big reasons is that once you’ve gained confidence and sorted out the tech, live video is a really quick and easy way to create content. I use a variety of tools to broadcast my live videos. OBS Studio is a great free tool for PC and Mac, and BeLive makes live streaming to Facebook or Twitch really easy from your browser. I also use Telestream’s Wirecast for some of my shows due to its powerful features. Restream.io will multi-stream to Facebook Live and YouTube Live at the same time. For my regular shows, I use Ecamm Live, which is an amazingly powerful yet easy-to-use tool for Mac. It allows me to bring in guests via Skype and I can share viewers’ comments, as well as graphics and videos. But content creation doesn’t have to stop when you press then “end broadcast” button. Live video can be repurposed into a plethora of other content types. Promotional Previews: Ecamm Live also lets me save a high-quality video file to my desktop that I can edit and upload to a platform such as YouTube. Sometimes, I rebroadcast part of the live video show as a Facebook Premiere; this option is available in Publishing Tools under Videos. Podcasts: For some shows, I repurpose the audio of each episode for a podcast. To capture the high-quality audio of the live show, I use Rogue Amoeba’s Loopback to take the audio from my guest in Skype and my audio into two separate channels in Adobe Audition. This makes editing for the podcast much easier because I have separate control of my audio and my guest’s audio. To illustrate, if my guest’s audio is too low, I can increase it without affecting mine. I can also route audio from videos and audio playing in Ecamm Live as a third track. Blog Posts: I use a WordPress plugin called Simple Social Press to import my live videos from Facebook to my blog. For each live stream, the plugin creates posts, embeds the video with the graphics as a featured image, and imports the comments from my Facebook live videos. 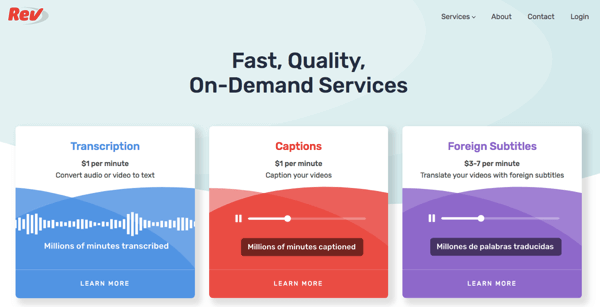 Transcriptions and Captions: You can use a service like Rev to get your recorded live videos transcribed and add the transcription to your blog posts as show notes. You can also request an SRT file to add captions to your videos after you’ve finished broadcasting. A high percentage of viewers start watching videos with the sound off so adding closed captions can improve the number of viewers. If you want to keep costs down, caption just the first 3 minutes of your video to encourage early viewers to turn the sound up. Ian Anderson Gray, founder of the Confident Live Marketing Academy, live-streams at Seriously Social. Instagram Stories is one of the best social video production tools I use. Stories video not only helps me stay active on Instagram and engaged with my followers—it lets me create valuable video content I can repurpose. I create tutorial-style content on my Instagram stories, then download the clips and use iMovie on my phone to splice them together into a native piece of video content I can repurpose for Facebook, Twitter, and my Instagram feed. Sunny Lenarduzzi, a leader in the video marketing field, has helped clients generate over $5 million in revenue directly from YouTube content. When crafting a video for YouTube that’s intended to bring in new viewers and subscribers, it’s important to remember that the viewer’s journey doesn’t actually start when they click Play. It starts when the viewer first sees your video’s title and thumbnail. The title and thumbnail set an expectation for the viewer. They may expect to learn something, gain a valuable new insight, or watch an inspiring story. 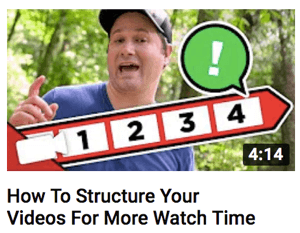 To quickly affirm for the viewer that the value you promised is coming in your video, open with a hook that’s directly related to the title and thumbnail. Many video marketers open a video by introducing themselves and welcoming the viewer, mentioning their company, and only then talking a little about the topic. 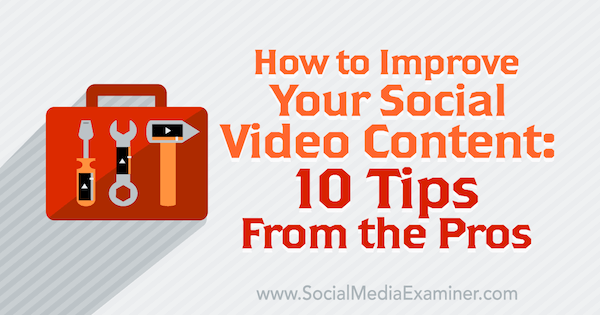 Often, the valuable content isn’t delivered until over a minute into the video. In YouTube time, that’s too long and audience retention graphs will reveal most of the audience is gone by that point. This translates to less watch time and less discoverability. You’ll see much better results by opening the video with your hook and possibly telling a brief story that relates to your potential customer’s pain point. After that, you can briefly introduce yourself and get right into delivering on the expectation the title and thumbnail set. Tim Schmoyer, a leading YouTube strategist featured by Fox, Forbes, BBC, and YouTube, trains creators and brands to master YouTube. 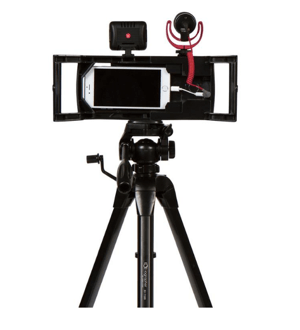 When it comes to producing video or live video, gear is important but it doesn’t have to be expensive. I’ve shot live video in the rain, wind, cold, just about any weather conditions you can think of, and there are three live video tools I highly recommend: a simple tripod, a Multi Case for your mobile phone, and a wide-angle lens—all of which you can bundle for compatibility at iOgrapher. The Multi Case gives me a wide, steady grip for shooting live video when I’m moving around, and it fits on a tripod for stationary shooting. It also allows you to add a Rode mic and extra lighting. I had no idea how important lighting was to create a more professional-looking video and thumb-stopping content until I started doing live video. Use an LED light that connects to your multi case or a separate pendant/selfie light to ensure you’ll have great light wherever you shoot. Once you have your gear sorted, you want to test your audio, lighting, and internet connection before every live broadcast. If you’ll be moving around in your video, do a test walkthrough. Make sure everything looks and sounds good, and that the internet signal stays strong. For example, if the signal drops to two bars, I won’t go live because there’s a high risk the signal could drop. Pro Tip: If you find yourself shooting outside in frigid temperatures, your phone battery will likely drain more quickly than it usually does. Use hand warmers to keep your phone warm. Jennifer Watson is a meteorologist and social media specialist for a big weather brand. Many video marketers forget that clarity is king. Clarity is more important than humor, high production value, or a great concept. If your concept, comedy, or production confuses your customer, you’re sunk. If your message comes across clearly, your customer can make an informed decision. Daniel Harmon, co-founder and chief creative officer at Harmon Brothers, has worked on video campaigns for Squatty Potty, Purple, Chatbooks, FiberFix, and Poo-Pourri. It’s important to be intentional with the video content you create. Rather than creating video content simply to keep up with a posting schedule, create content that specifically addresses the topics your target audience or customers are searching for in search engines like Google or YouTube. 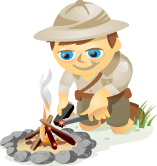 To discover which topics are most popular and find suggestions for keywords and phrases people are actually typing in, use the Keywords Everywhere browser extension plugin for Chrome and Firefox. You’ll also be able to see the search volume and search numbers for each set of results. Take a step back. Instead of creating a video and then working to get it found by an algorithm or viewers, look to see what people are actually searching for—what you can help them with—and create videos on topics you know people are looking for. Justin Brown, co-founder of Primal Video, is a Netflix-featured producer and video marketing specialist helping entrepreneurs leverage the power of online video to build and scale their businesses. After testing hundreds of videos, we’ve found nothing is more powerful than a human face, so we always have a spokesperson deliver our top-of-funnel video. Hook viewers with something thumb-stopping and follow up with a teaser: ask a question, deliver on a promise, or present a cliffhanger that has a payoff later in the video. Introduce your brand in the first 20 seconds and then address the problem, making certain to focus on pain points your product solves. Present your solution and deliver a call to action; people want to be asked to buy. Repeat the problem and solution, and follow up with another call to action. Close with an outro that remixes your problem and solution with a call to action. Pro Tip: In post-production, increase the speed of your video by 2%-10%. People listen much faster than people talk, and the quicker you can give viewers information, the better. Travis Chambers, founder and chief media hacker at Chamber Media, creates scalable social video ads on Facebook and YouTube that drive millions in sales. The secret to successful social media video is workflow and the most powerful tool in our toolkit is Camtasia. Camtasia is an easy-to-use tool that any beginner can use to edit a video into a widescreen or square aspect, add text, cut down footage for timing, and break up a video into little pieces for repurposing. Having such a handy tool enables us to quickly move our videos from the editing room to the internet, so we can spend more time promoting the content and focusing on sales. Owen Video is a YouTube marketing consultant specializing in small business growth. His YouTube channel has almost 1 million minutes of watch time. The day before you want to go live, make sure to promote your live video stream by using Instagram’s Countdown feature in your Instagram story. Users who tap on the countdown can then set a reminder for your live stream and get a notification when the counter hits zero. People can even share your countdown timer to their own story. Another useful feature Instagram recently introduced lets you showcase pictures and videos from your camera roll directly in your live video. You can use this feature to highlight fascinating facts and figures, share photos of your team, include a supporting video, or even showcase favorite follower posts from your community. Alex Khan, Germany’s most followed social media coach and a Top 10 Live Video Influencer, has worked with Red Bull, Microsoft, and Lufthansa. What do you think? Which of these tips do you find most useful? What tool will you try? Share your thoughts in the comments below. Learn how to schedule a Facebook Premiere. Discover how to create Instagram story video people want to watch. Learn how to use IGTV for business. Lisa D. Jenkins is Managing Editor at Social Media Examiner. Her expertise in social media comes from years of serving destination organizations and businesses in the travel and tourism industry.